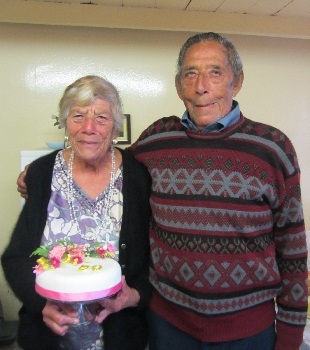 Obituary for Tristan da Cunha islander Daphne Repetto, who passed away 13th September 2017, aged 81. We regret to announce the death of Daphne Repetto who passed away on Tuesday 13th September 2017, aged 81. Daphne was born Daphne Teresa Swain on the 20th October 1935 to James and Florence Swain, and was the eldest of five daughters. She married Ernest Repetto on 22nd July 1957. They had one son Clive, who was born in 1958, but sadly Clive died from asthma related symptoms just before his 11th birthday in April 1969. She spent a lot of time looking after the children of family and friends as well as helping them in a variety of other ways. Daphne worked as a processor for the fishing company into her seventies, until the onset of dementia prevented her working any longer. She had also worked in the past as housekeeper for Agricultural Officer Stiubhard Kerr-Liddell. Daphne was a fun loving person who enjoyed parties and having a laugh. She passed away on the 13th September after a short time in hospital. She will be greatly missed by family and friends on the island as well as overseas. She is survived by her husband Ernest and sisters Joyce, Nancy and Barbara. Daphne Repetto pictured with her husband Ernie on her 80th birthday.